I've designed a quilt and it's going to be used at The Round Bobbin Quilt Shop http://www.roundbobbinquilts.com/shop/Block-of-the-Month/p/Fab-Five-x3002438.htm for the Fab $5.00 BOM program. What that means is if you come to the shop and sign up, pay $5.00 and get your first month's block packet- then go home and make the block(s). The following month there will be a presentation of the next packet and show and tell. Bring your completed block(s) and get this packet for free. Continue making your block(s) each month for 10 months and always bring them in to show at one of the meetings and you will receive all 10 months of blocks for just $5.00! What do you think? Are you a traditional fabric or a Batik person? The fun in this design is that you can move the blocks around....exchange the same size block in any matching size position! I am starting to make a Christmas fabric version of Cottage Puzzle and I think each of my four children might get one for their homes! Raffles, don't we all love to spend a buck to try and win something, anything? How about 6 tickets for $5.00, a chance to win and a bargain all in one! If you've ever attended a quilt show you know how Guilds love to raffle off quilts to raise funds. Guilds use their funds for the guild, speakers, bus trips and other quilt-related activities BUT they also support charities. The County Line Quilter's, the guild I belong to supports our local food pantry, a children's home in another town, a woman's shelter for abused women, we make quilts for the military and for babies. Quilter's in general are a caring, generous people, in my experience. Back to the Raffles, I do love them but I get so discouraged when the tickets do not get a good mixing. 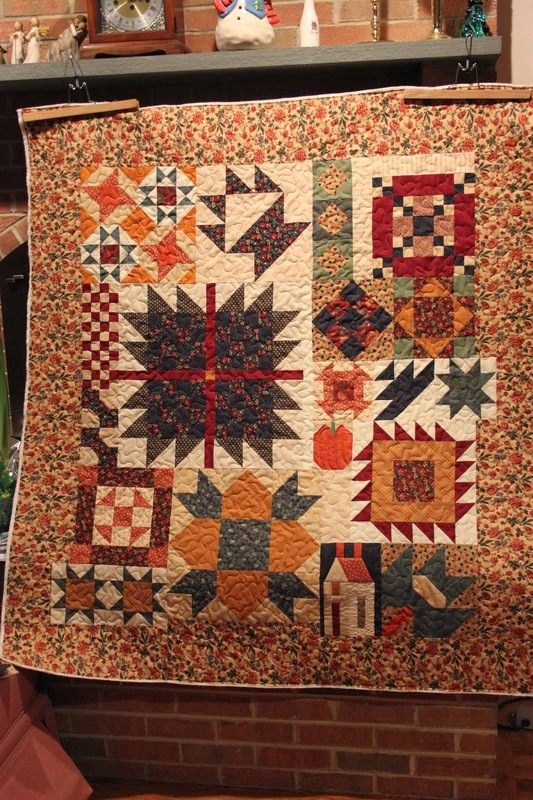 Today for instance I was at a show with my Mom and we bought tickets for their large raffle quilt, which is very pretty! We also bought tickets for a mini-quilt raffle in which there were over 20 small quilts that were raffled off at a certain time. There were three separate draw times so they had over 60 mini-quilts to raffle off at 3 tickets for $1.00. What a great group of minis they had! At the appointed time the ticket holders awaited the calling of the numbers with tapping toes and bated breath. They had looked at the quilts and taken time to decide which numbered bag to take their chances on. The Mini-quilt Chairperson did the picking, she stuck her hand in each bag and chose a ticket. Almost all of the numbers were close, you could tell when they were put in the bag by what they were in sequence....one lucky winner won not 1 but 5 quilts! Another lady won 2 and everyone cheered when a winner came forward until the lady with the 5 wins who became so embarrassed she was slinking up to claim her prizes. These tickets were not mixed up, had the Chairlady held each bag closed and turned them upside down and shook them, then it would have been a better raffle. I am looking at ways to help my guild with raffles, to make sure that every ticket gets a fair shake! I want to support the guilds, the members who worked so hard on the quilts and on the show but I also want fair chance to have my ticket or yours chosen! What do you think? Do you have any suggestions to get those tickets shook up more? Please post a comment and let me know! Happy 2013! What a year 2012 was for our family both good and not so good but we've survived and are all looking forward to better things this year! I love Quilt Shops and Quilt-y People, I love fabric! I started sewing when I was in 8th grade and have never stopped since. I love creating and though my beginnings were in clothing I am mostly a piecer and quilter now. My first job at 16 was in a fabric store called The Stitchery in Lake Hiawatha, NJ. I loved working there, not only was it bright and full of fabric and notions but we had to make samples of the newest fabrics! Oh to be working when new orders arrived and get to choose a pattern to create with the newest fabric lines! I outfitted my entire family while working there. Back to the Quilt-y People of whom I know many but don't always get to see. Yesterday I arranged to meet a new customer, Wee, at The Round Bobbin Quilt Shop, www.roundbobbinquilts.com/ where I also work part-time. Susan, the owner was a former co-worker at Country Quiltworks. I walked in and there were several of my Quilt-y friends, Sue K., Dolores R., Susan S., Sue E., Sally M., Carol M., Storm E., Peggy B., Brenda T., & my newest client Wee. How lovely to see so many familiar faces and to be hugged by such kind and giving women! I felt so buoyed when I left and that warm feeling lasted all day. It amazes me how being around people or talented women such as my friends improves your outlook and feeling of well being. This is why we need our Quilt Shops, Knitting Shops, Craft Stores and Book Shops, to be connected to each other in this world were everyone is so disconnected by electronics. In a world where we can have instant everything sometimes it's better to take time to seek out what our heart needs to be happy. Finding just the right pattern, book or song having someone who knows how you feel about your craft to share it with or bounce ideas off of. This makes Community and we need Community to survive as people, we are not meant to go it alone. Seek out your Community, build your Tribe and find a better life, more joy and be creative. Blessings to you and yours in the coming months! What a difference a few days can make, the test quilt that I mentioned Monday is all pieced and I love it! The colors so rich that they make me smile. I'm calling this one 'Little Gems' and it will be in Donna Lynn Thomas' next book that will be published by Martingale next fall. There is also a very cool ruler that Donna designed to take the math out of using bias cuts. The ruler is made by Omni and will be out in the spring of 2013 along with it's own pattern. If you would love to make pieced borders to make your quilts extra special then you will love this ruler! Today I took a class at the Round Bobbin Quilt Shop, in Horsham, PA. Susan Shiveley was the instructor, I've know Susan for years, she is not only an prolific quilter and pattern designer but a math professor. Her designs are often math driven, they are very different than the run of the mill quilt patterns. I've quilted for Susan but this is the first I've made one of her designs and I found it to be like solving a jigsaw puzzle. 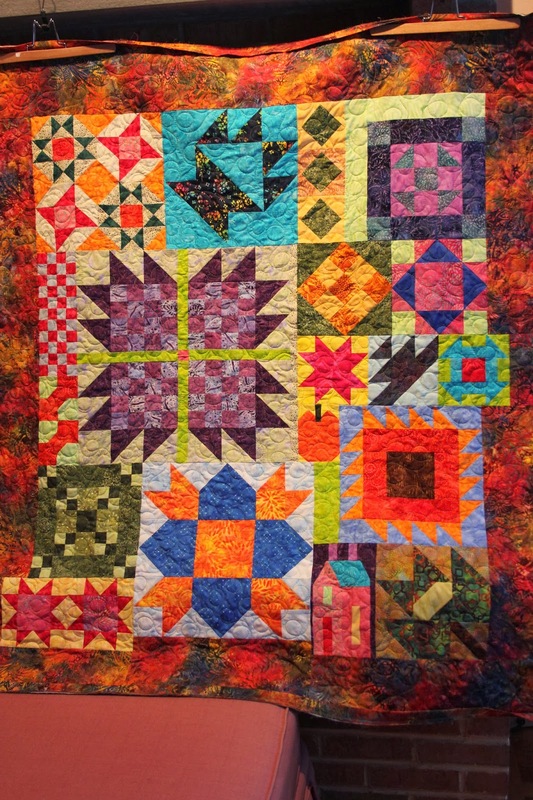 Change is good and this quilt was pieced differently than what you usually see in patterns. I had to think and thoroughly enjoyed the process, even better it was a small project and it was just about complete when I left the shop today. I'm still deciding if I want to add another border, if I don't then it's done but for the quilting and binding. Isn't it pretty? Here in Bucks County we are waiting for Hurricane Sandy to arrive, the predictions are pretty bad with this being a huge storm that is meeting up with a cold front and will become a monster nor'easter causing millions of dollars in damage, lost property and power outages. Everyone please stay safe and be prepared! I'll be here sewing or cutting out more quilts!